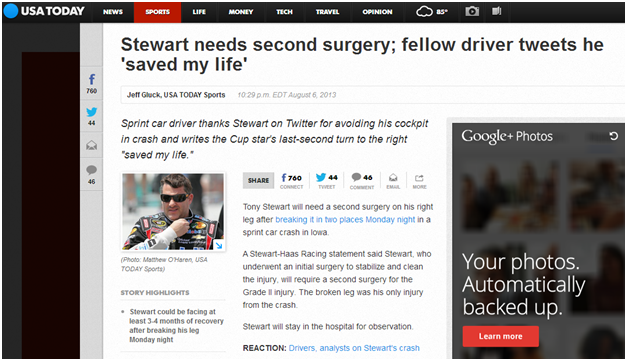 On August 6, 2013, an article published on USA Today’s national online site discussed the leg injury NASCAR driver Tony Stewart suffered in a crash recently, which has become a popular topic in sports media. This particular article discussed how Stewart will need surgery for his Grade II fracture of both the tibia and the fibula, and how his absence might affect NASCAR this season. 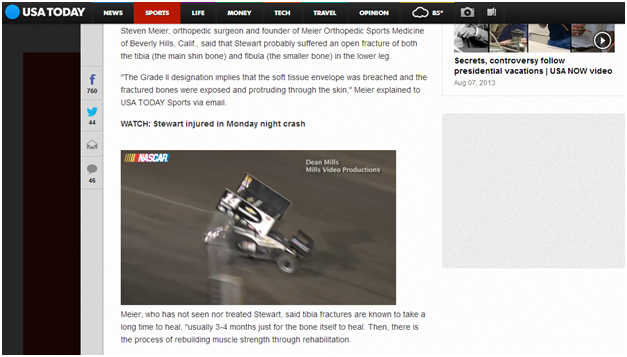 Dr. Steven Meier, world-renowned orthopedic surgeon at Meier Orthopedic Sports Medicine in Los Angeles, offered his professional opinion and predictions regarding Tony Stewart’s injury. However, while tibia fractures tend to take about three to four months to heal, which may put the star NASCAR driver out for the rest of the racing season, Dr. Meier said that if the bones are rigidly fixed with an intramedullary surgical rod (as he predicts will happen), then Stewart’s return to his Number 14 Chevrolet could be sooner than expected, unless there are complicating factors. If you have suffered a sports injury or have another condition affecting your bones or joints, please don’t hesitate to contact Meier Orthopedic Sports Medicine today. You can schedule a personal consultation with Dr. Meier by calling 310.736.2793 or by filling out our online contact form! Next, read about bone fractures.